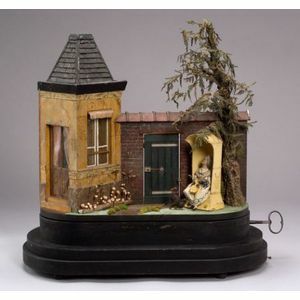 Early Scene Mecanique Automaton of a Spanish Serenade, possibly by Phalibois, circa 1870, modeled as an enclosed garden with painted brick wall and path leading to a rustic gate, on the left a single-storey building of simulated stone with pitched shingled roof, grain-painted French doors and glazed window with lace curtains screened by a striped silk canopy, at the right a papier-mache tree with cut-fabric leaves shading a basket chair with incumbent elderly woman knitting, a bulldog at her feet, a matador strumming a lute at the gate, and a lady concealed in the inner room, the three figures with articulated carved heads and hands, original wigs and silk costumes trimmed with braid and gold Dresden paper, on three-tiered ebonized base containing the pull-string two-air cylinder movement with tune-sheet and large going-barrel automaton movement driving twelve wood cams with brass runners, two weighted see-saw levers (for the matador) and a painted-tin turntable to open the gate, ht. 24 in. Note: This exceptionally-complex piece has thirteen movements operated by tightly-cut wood cams arranged in three groups on an extended shaft to accommodate the length of the base and the long sequence of actions. The five cams closest to the mechanism operate the nodding dog and the old woman in the chair, who looks up-and-down while knitting with both hands to the clacking sound of the needles. When the gate opens and the matador emerges on the turntable, strumming the lute and nodding his head (operated by the middle two cams, the pulley and the see-saw levers), the old woman stops knitting and turns her head to observe. Then the double windows of the tower swing inwards and the lady emerges, leans forwards, nodding her head and throwing kisses, operated by four of the five cams in the final set. The fifth cam in this set operates the spring-loaded action of the gate, which closes after the matador, the old woman resumes her knitting and the sequence begins again. Both Phalibois and Theroude used wood cams in their automata, while the number and the complexity of the movements, the picturesque subject, and the modeling of the figures is similar to the early coin-operated automata by English makers such as John Dennison, which were acquired from Phalibois and later Vichy (amongst others) for conversion to coin-operation.